Stories and experiences of my various journeys around the world. Inspiring you, to your next holiday with a new story every time. This takes place as you walk on your way to an attraction, often at known landmarks and museums or sites. As you pass by the crowd, a seemingly random stranger suddenly offers you a “genuine” bracelet or other form of jewellery while quickly tying it into your arm, if you are not quick enough to parry him or her. Even if he offers it for free, never believe it for a moment. Just walk away and say “non merci” or "no grazie", just as many others do. A simple rebuke may anger them, but be firm and never fall for their next moves, whether to curse you or beg for another chance. People asking ‘Do you speak English? The question may be simple but it’s also a bait you can easily fall — English speakers are more likely foreigners than locals. Assuming the role of a tourist, a scammer may ask you if you know the universal language, so he can strike a conversation. The next sentences could be the well-rehearsed lines aimed at asking you for money for whatever reason (he lost his passport, he was robbed, and so on). This tactic is often employed on popular tourist attractions, notably big train stations like Termini station in Rome and Gard De Nord in Paris. It is a huge tourist trap, really. Having a drink or food around a famous attraction means you will be paying 3–5 above normal prices. Instead, take a walk and have a drink or food anywhere else on another street. Another great tip is that if there is an English menu in a non-English speaking country, the prices will be much higher as well. Don’t pay museums, visit them on free days. It is really not necessary to pay for the entrance of the museums when you have many to-do options in a city. Almost all museums in Europe has a couple of specific days for free entrance. Before you plan your trip, don’t forget to check the free entrance days to museums online. The Mona Lisa is TINY, and you'll need to elbow your way through massive crowds to get a closer look. 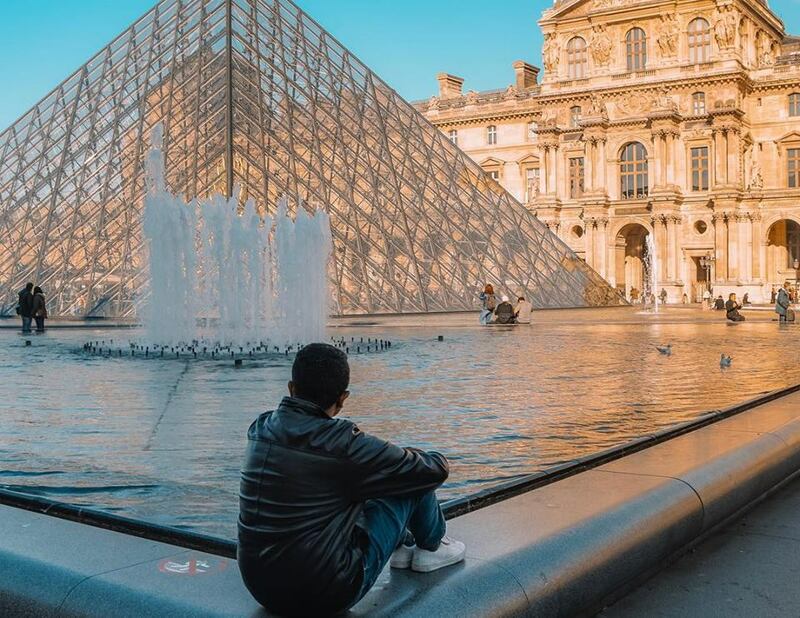 The Louvre is filled with gems — check out literally any other piece of art there. Sure, you can consult a tour guide or concierge about where to spend your time in the city, but you’re better off getting closer to the source. Chat up locals on the street or in neighbourhood pubs. They’ll direct you to the best places to eat, shop, and find smashing deals. Although it wouldn’t hurt if you offered to buy their next pint for them. One of the biggest perks of being in a new city is the fact that you have no clue where you are! Ditch the map and use this to your advantage by spending time at leisure wandering around the cobblestone streets on your own. You sure will stumble upon cool attractions you wouldn't have seen otherwise, and it comes with a bonus which is you get to forego the commotion that comes with crowds and typical tourist traps. As said earlier this eternal city is a walking museum. No matter how hard you try, it would be impossible to see all of Rome in a short period of time like 3days. After all as they say 'Rome was not made in a single day'. However, in my time in this beautiful city I explored the famous places and here is something about the iconic attractions of Rome. Start your day early and head to the Trevi fountain, toss a coin over your right shoulder and make a wish. It is believed that if you toss a coin into this fountain you will at some point of time make it back to the eternal city. Visiting this place in the morning will be a better option as the crowds will be less. Grab a croissant and cappuccino at a standing bar (one of the most important things to do in Italy, it only costs a few Euro and the experience is surely worth it) on your way out in one of the alley ways and head straight to the most iconic monument in Rome and one of the natural wonders of the world, The Colosseum. I am sure this monument will on everybody's itinerary in Rome. You are sure to get teleported back in time and enter the world of Gladiators and Kings. Of course, you must sign up for a guided tour if your not to good with History. Guided tours not only give you a good insight about the city they also privilege you with skipping the massive entry line to this monument. 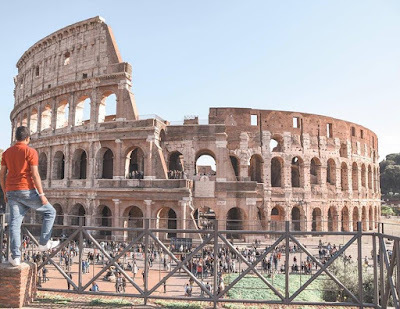 Yes, guided tours are expensive and if you are a budget traveller like me the top most hack would be to get your hands on the Roma Pass which give you skip the line access to the Colosseum, but obviously without any history lessons about the place. Entering the colosseum also means you are able to enter the Roman Forum and Palatine Hill. This one of the most ancient parts of Rome, which consists of beautiful gardens, temple ruins, baths of the various popular people from the Roman empire and of course palaces of the various Roman emperors. After enjoying the views of the eternal city from the Palatine hill you can get some lunch around that side of the City. When in Italy the routine here is very laid back so do not expect any cafe or pizzeria to open early. Lunch is generally available a tad late from the regular time and dinners are served in restaurants only after 8 PM. Italians fancy a snoozy in the afternoons so many and I saw many restaurants shutting between 3:30PM-4:30PM. Plan your time accordingly and if anything doesn't go as per plan Pizza, Pasta and Gelato are on everybody's menu here and you can fill your stomach with some delicious Italian cuisine and head to the Piazza Venezia for sunset. Sunset is pretty early in Europe during the month of November and hiking up to The Vittorio Emanuele II Monument, also known as the Vittoriano, Il Vittoriano, or Altare della Patria is one of the gorgeous places to witness panoramic views of the city and witness one of the dreamiest colours of Rome as the sunsets. This monument was built in honour of Victor Emanuele the first King of unified Italy. This building resembles a wedding cake and you cannot miss the enormous monument at Piazza Venezia. Hiking up to the top most level will cost you 10 Euro, and it is totally worth it. Visit the Vatican City. A city by itself one of the smallest cities in the world is surely got to be on your itinerary in Rome. I started early got some coffee and croissants at a bakery near the hostel and took a bus to the Vatican. Buses are easily available and you can take a bus from Termini station to get to the Vatican and start your walking tour here. A pre booked tour is definitely worth the money here and again it saves you the time by giving you the privilege of skipping the long line. A complete tour here includes - the Vatican Museum, Sistine Chapel and St. Peters Basilica. A minimum of 5 hours is required to finish this tour and it can get time consuming on weekends. This tour should cost you anywhere between 60 Euro and 90 Euro with a guide giving you some incredible insight of the place. When it comes to guided tours I would recommend 'The Roman Guy'. This group provides one of the finest tours of several monuments in the City. Yes, they are priced higher than average but they are definitely worth it. After the tour of the Vatican, a good lunch was on the itinerary after which I head to the coolest neighbourhood in Rome, Trastevere. Trastevere is a funky neighbourhood located on the other side of the Tiber river. It is colourful , funky and is known for traditional trattorias and artisan shops. Simple BnB's or multi community apartments are located all around this bohemian neighbourhood. An evening in Trastevere is my top recommendation. I had signed up for a free guided walking tour on Couchsurfing and I totally enjoyed walking through the graffiti walls and to the various Piazzas. Here, several cafes and pizzerias sell 'Suppli', a typical Roman cuisine and it is super delicious! Ended my day at the Bar San Castilo. This is easily the place to rub shoulders with locals and enjoy some ice cream, drinks or coffee. It is super cheap and it buzzes till night. Cafes, bars and restaurants are open in Trastevere till 2am it is definitely the place to have a night out at. On my way back to the hostel me and a few friends visited the Trevi fountain again at 4am, it was truly an epic moment. Me an Indian who met an American, South African, Swedish and a guy from Faroe Islands on the trip, sharing our experiences and walking on the cobblestone roads of Rome leading up to tossing a coin at the Trevi where we bumped into a British couple who was early on at the same bar as we were at was an epic memory I have from my trip. 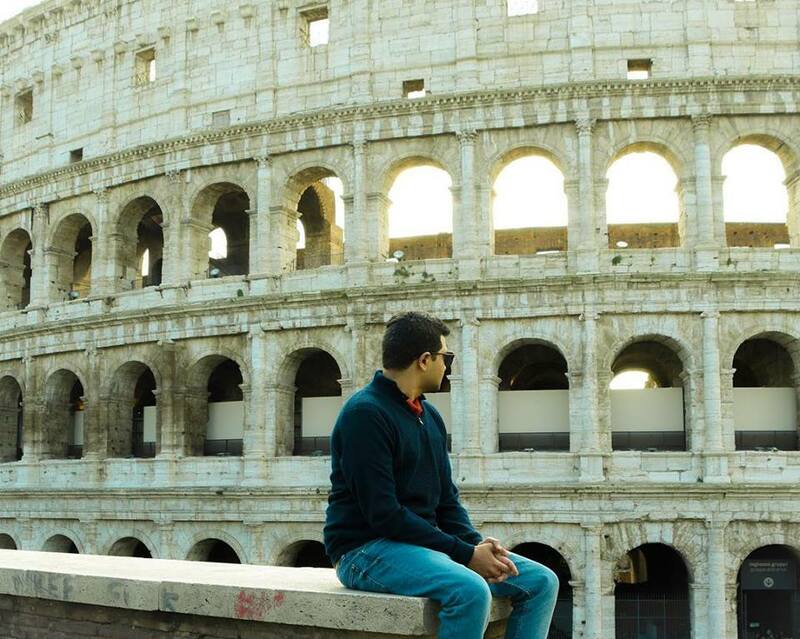 Easily one of my #wheninrome moments. Anyway, Trastevere is the place to be in the evenings! It's an unforgettable experience. Start your day by visiting Circus Maximus. The Circus Maximus is an ancient Roman chariot racing arena. Another ground of entertainment for the people of Rome. You can head to The Pantheon which is the former Roman temple. It is one of the most preserved and influential buildings in Rome. It is one if the monuments in Rome which is still intact. Get some delicious lunch at one of the eateries at Piazza Novona, another significant place of Roman history where people would gather to witness prizes and awards being distributed. Today this square is home to many restaurants, bars and cafes serving some finest cuisines. A good place to pick up a post card or souvenir. 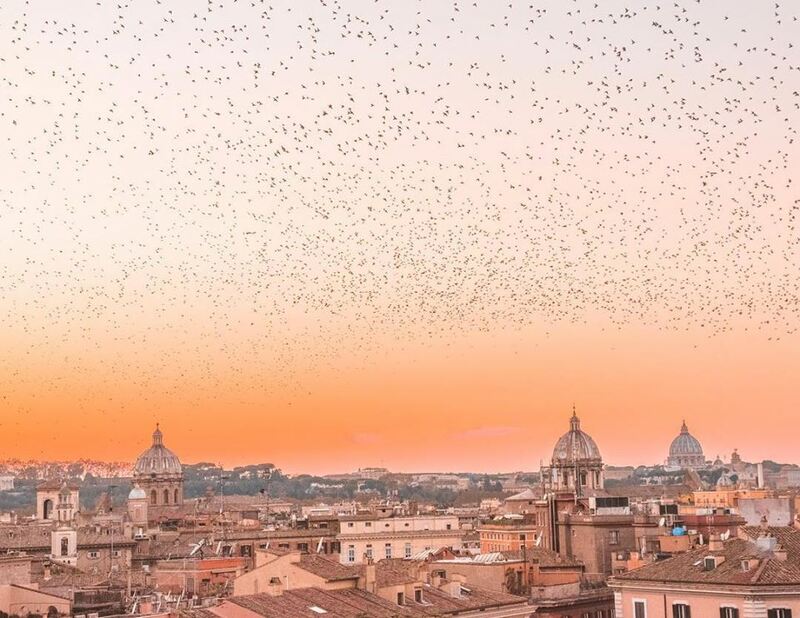 End the day by watching an epic sunset over the Spanish Steps. A staircase of 135 steps lively with loads of people hoarding around. Fountains around this populated place and the Trinità dei Monti church at the top are some of the places not to miss in this locality. Part I - Introduction, Getting around the city and where to stay. Easily one of Europe's most travelled and iconic city. I have always been a world History lover and have grown up to finding fondness with the Roman History, watching movies and documentaries such as 'Gladiator' and a HBO series called 'Rome'. Rome is an incredible walking museum and of course walking on the cobblestone roads around this city is one of the best ways of exploring it. Of course, I just did that! The most epic moment or my #wheninrome moment was getting lost in the streets of this eternal city with people from different countries and cultures who I had met a few hours ago and become friends with them as the days were flowing. Rome, is exactly that, a city with a long history, mixture of cultures from around the globe, some of the most delicious food and some of the finest art and architecture in the form of monuments and ruins across the city with a bonus of experiencing one of the natural wonders of the world. A big advise when it comes to Rome or Italy generally is that life here is laidback and slow so please do not be in a hurry to do many things. Just forget the pace of the city where you have come from and let the Italian way of doing things make you dissolve into it. Putting everything together here is my ultimate action packed three day adventure when in Rome! Rome is a big city, it has a huge transportation system and places are well connected via metro and bus services across. English is widely spoken here and it is super easy to manoeuvre from places but I will recommend you to learn a couple of basic Italian words and sentences it makes life more simpler. After all Italian is the language of love and romance. Euro is the currency that is used here and all most all shops accept cash and card payments of the same currency. Small museums and souvenir shops might only accept cash so it is always advisable to carry a few Euro in the form of cash. As for Forex, I always recommend to covert currency at your home country or the country where you have a bank account. Currency converting means you pay a commission while buying a foreign currency, it means you lose money while making the transaction. Hence, always better to make one transaction at your home country and pay a commission than by paying a commission every time you convert as and when you require currency. Rome, is located off the Mediterranean Sea and it enjoys warm temperatures most of the time. Expect rainfall during winter days here. A good time to visit this city would be during Spring(April to June) or Fall(September to October) as the tourist crowds and school groups are not found. August is the month to avoid here with maximum tourists. A bigillion airline fly to and from the Fiumicino Airport in Rome. Another option would be to wheel into Rome, the Termini Station is the centrally located station in Rome and is well connected to major metropolitan cities in Italy. When it comes to manoeuvring within the eternal city there are several options, such as taxis, self driving or public transport. Taxis are super expensive and the least recommended mode of wandering in the city. Self driving is also less advisable in Rome within the city as the Italian drivers are insane. However, if you may wish to do that or rent a Vespa it is easily available in the city. Indian Driving Licence holders will require to hold an international driving permit. An IDP can be obtained from the RTO. However, in my recommendation the ideal, best, romantic and budget friendly mode is walking around by foot and discovering hidden corners and alleyways, again for larger distances where you cannot walk you can always use the buses, metros or trams. 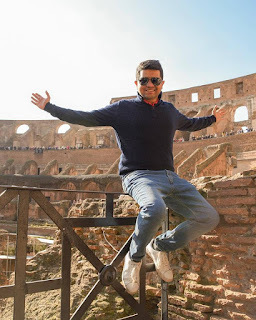 The best deal for a three day Rome experience would be to get the Roma Pass. It costs 38.50 Euro for 72 hours and 28 Euro for 48 hours. The 72 hour pass comes with skip the line entry for 2 museums and the 48 hour pass comes with skip the line entry for 1 museum. Highly recommend this for all genres of travel. It came of maximum use to me personally when I was privileged to skip the line and enter the Colosseum which is super crowded all throughout the year. There are various option in the eternal city. Budget friendly hostels are ideal for bag packers are in plenty near the termini station. These hostels can be an ideal option for group of friends as well and advantageous as they are cheap and are at a prime location. I was a solo traveller and stayed at the hostel called 'The Yellow'. This is one incredible hostel with all basic facilities very well maintained flawlessly. It gets lively in the evening with its vibrant social life which guarantees epic experiences while staying in Rome. I paid 56 Euro for 2 nights/3 days here. It is a top recommendation as if you are travelling solo or with a group of friends. It will surely make your experiences in Rome worth it. The other top option apart from hostels are Airbnb's which are scattered all around the eternal city. Airbnb's are a good option in Trastevere, the coolest neighbourhood in Rome. Its graffiti painted walls and bohemian streets make it everybody's top choice. Here you have got to book your accommodation well in advance and its always packed with tourists. Trastevere, also has hostel accommodations available. 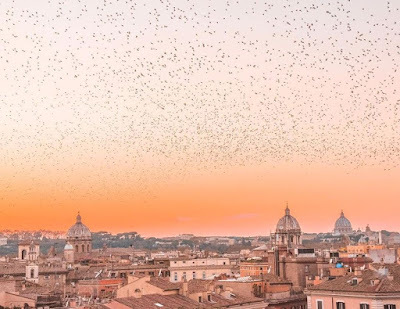 The third option, you can also have the option of staying in hotels right in the heart of the city, near the Colosseum, Spanish Steps, Trevi fountain, Trastevere or even the Vatican; which is its own city depends on your budget, there are plenty of options to stay. 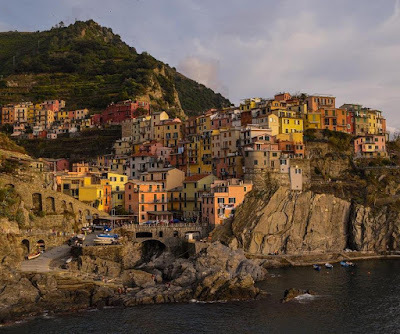 Cinque Terre (meaning five villages in Italian) is a beautiful place which is a culmination of five fishing villages on the Italian Riveria and a UNSECO world heritage site located in Liguria Italy. The five villages comprise of Monterosso al Mare, Vernazza, Corniglia, Manarola, and Riomaggiore. The vibrant colours, breathtaking views of the costal and mountain trails draw many visitors annually. Locals in Cinque Terre have built terraces, wine yards, orchards and plantations all around the mountainous regions of this landscape. Obviously I learnt about this place via Instagram and without second thoughts made it my top bucket list place in 2018. Planned my travels to Italy during fall and again without thinking twice included this gorgeous place in my itinerary; it was another perfect place for a solo traveler. However, I am sure this place attracts all genres of travel- group travelers or couple travelers and I was told that it is a top place for destination weddings. 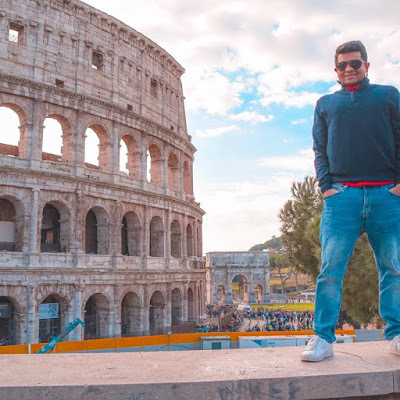 I was able to accommodate a day trip here and it was fun filled with loads of adventures with scenic landscapes, preserved architecture and insanely delicious Pizza! Based on my experiences I have put down a complete guide to visiting this place and in my opinion this has got to be on every travel enthusiasts list. The best time to visit Cinque Terre is without a doubt the summer months. It is the high season here is July and August and brings many people to this awesome place. If you want to avoid the crowds May and early June are good months with warm temperatures and less people. September is also a good time to visit with the high season coming to an end. If you want to take the risk of October and November which is off season there are chances that you get stuck with rain and you remain indoors all day or you might be able to explore the villages superficially with the suspension of the ferries and hiking paths due to weather conditions. Off seasons brings negligible number of people to this place and streets are quite. How long should one stay at Cinque Terre? Cinque Terre can be explored in many ways from day trips to overnight stays to hiking across the mountain trails over many days at leisure. If you are really tight on time Cinque Terre can easily be done in a day. Day trips can cost anywhere between 55 Euro to 90 Euro. I Paid around 60 Euro (INR 4800) for my day trip. Why did I opt for a day trip? Reason being the hiking path was closed due to heavy rainfall caused landslides here a few days ago. Hiking was my number one agenda here but I was told that November is not a suitable time to hike here and the best season to enjoy the mountain trail is the summer season. Many tour agents operate from Florence and other major Cities providing day excursions to this lovely place. I had opted for one of the day trips from the hostel I was staying at in Florence and I can only recommend this if it’s your last resort and you are short on time. 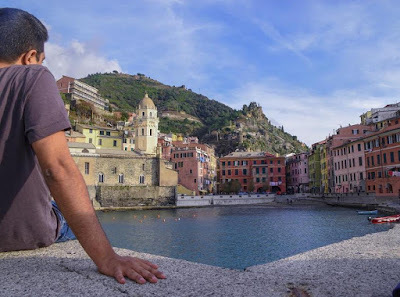 Tour groups are a fun way of socializing and making friends however I think my day tour could not do justice to the place and I would have liked to spend more time in the various villages, or maybe I can say that Cinque Terre can best be explored in at least 2 – 3 days. Overnight accommodations and budget stays can easily be available. Best places to stay here are Monterosso, Riomaggiore or Manarola. It gives you a better insight into the atmosphere here and gives you time to soak into the culture of Italy and visit each village in depth. If you have more time you can always add Portovenere, Levanto to La Spezia to your itinerary. 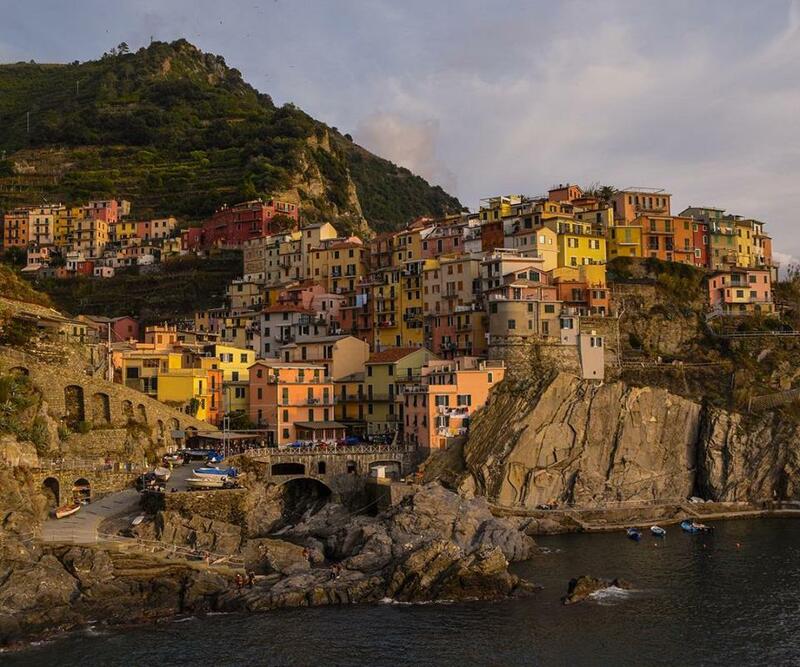 La Spezia is the closest city to begin your Cinque Terre travels from. You can take a train from Florence, Rome or Pisa depending where you are based at. Pisa is the closest Airport to La Spezia and a train journey is just 1 and half hours away. During summers you can also take ferries from La Spezia which connects all villages (except Corniglia which doesn’t have a harbour). Neighbouring ports of Portovenere and Levanto also have ferry services to the various villages around the Italian Riveria. The views of these villages from the water are surely worth it. Day tickets if you want to ferry arcoss or take a train across Cinque Terre are available at the office at La Spezia train station. La Spezia is also the place where the hiking trail of the Cinque Terre National Park begins. My tour began with a bus from Florence to Cinque Terre super early in the morning (duration is a little more than 2 hours approximately). To hike across the coastal path from Monterosso al Mare to Corniglia you need to buy a Cinque Terre card which cost 8 Euro. This can be bought on the path itself. However, if you walk from Corniglia to Riomaggiore there is no need to buy a card. This card includes free toilets and access to Wi-Fi. If you do not want to walk there is also a train version which cost 16 Euro for one day .The easiest and most common way of getting to and around the five villages is by train. Tickets cost around 4 Euro for a single journey in case you do not want to buy the pass and explore each village leisurely. Trains run between 5:30 AM to 11 PM. A print out of the time table is available at the various train stations. During the summer months one can opt for the ferry service and ferry around the five villages for a different experience. Ferry tickets for the day cost 35 Euro and they include unlimited ferry rides. Cinque Terre is home to a number of adrenaline pumping activities such as hiking, kayaking, snorkeling, paragliding and the list goes on. Ideally many tourists visit this UNESCO world heritage site to hike along the coastal trails and witness some spectacular views and landscapes of the ocean and the mountains. 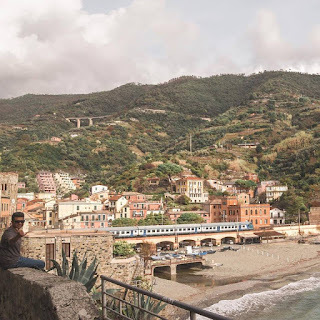 Hikes begin at La Spezia and finish at Monterosso al Mare. Alternatively you can also take a train from La Spezia to Monterosso and begin your hike there going backwards and finish at Riomaggiore. Unfortunately I could not hike this path as the weather was not favourable but I was told by people who have visited this place before that the hikes are not tough. From Riomaggiore, you can go sailing or swimming or if you’ve begun your hike from La Spezia you will finish at Monterosso and swim at the beach there. Monterosso is the only village in Cinque Terre with a real beach! There are many kayaking trips that can be arranged from Riomaggiore. Apart from physical activities Cinque Terre is home to a few monuments and churches that can be visited. Also you may visit a wine yard for some wine tasting if you wish. Well if you want to push yourself and make that bucket list interesting cliff jumping is a great thing to do at Manarola. Nothing much, travelling easy with less baggage is always the best! A good pair of walking shoes is a must as there is a lot of walking around in the many villages. If you are opting for the hike then obviously again a good pair of sports shoes is a must. I would also recommend packing a water bottle as there are many free water taps where you can refill to keep yourself hydrated no matter the season. Swimmers and sun block is a must again if you are keen on taking on the beach after a sweaty day of walking. English is widely spoken across Cinque Terre so you can easily find your way if you get lost. You can also carry your camera to document your experiences with raw nature. 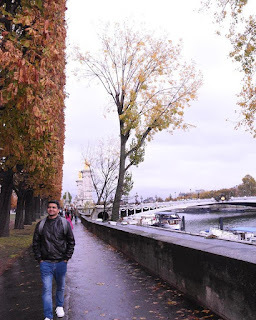 Lost with the Parisians - My Paris Experience(Part 2). Slowly getting accustomed into the European culture and lifestyles was on my mind and I just did that on my first day in the city of art, magic and romance. Opted for an art exhibition by Gustav Klimt at Atelier des Lumières to get things underway. The skip the line ticket here cost me 15 Euro (INR 1200). It was a new form of art I had never been exposed to before and exploring this in a non touristy neighbourhood of Rue Sant- Maur with a local was a different and very exciting experience. It was also impressive to see the response Parisians have towards art exhibitions. From one neighbourhood to another I continued exploring La Marais and ate a super delicious falafel sandwich at the restaurant called L'As du Fallafel which is at the Jewish quarter at the La Marais neighbourhood in Paris. A good meal here cost me approx 12-13 Euro (INR 1000-1100). Later that evening I had a super awesome Airbnb experience and explored one of Paris's oldest clubs known as 'REX club' with likeminded locals. Entry to the club cost me 15 Euro(INR 1200). All this was just to set the character for the big Europe trip ahead of me. I would surely recommend this to all travelling not necessarily in Europe but also anywhere around the globe to take a day to get accustomed to the lifestyle of the place, the language and the way locals commute, the restaurants and the hangouts they recommend. Again Couch Surfing and Airbnb experiences with locals big recommendation from me. For me it was a great way to get things underway and get a feel of the culture and lifestyles. Of course, falafel is not a French dish but I ended up at this restaurant after getting lost at the La Marais neighbourhood something which was completely unplanned and it turned out to be a brilliant decision. Well, you only get lost to find yourself and I found a new side of mine which is how much I love falafels! Getting a feel of Paris on my first day with the locals, I started off my second day by visiting the Cathedral Saint Michel Notre Dame, exploring the area and the amazing way in which the walls and pillars are made was a very interesting experience. Later I was out and about heading to the famous Louvre museum. Being out and about Paris was so smooth thanks to my experiences on the first day. Yes, I did enter the Louvre to see the Mona Lisa by Italian Renaissance artist Leonardo da Vinci. Entering the Louvre cost 15 Euro(INR 1200), well I can only recommend this if you are a sucker for artistic and renaissance paintings from across the world. Otherwise you can always sit around the glass pyramid and admire the Louvre Palace, the Arc etc. The vibe around the place is positive a good place to watch the sunset between the glass pyramid. It can get crowded during peak hours as it's known to bring the most number of visitors annually (Skip the line entrance ticket is highly recommended here). Also, you can buy a Paris museum pass if you are interested in visiting several museums during your stay. As a tourist you've got to be alert as at crowded places pick pocketing is a common act here and a touristy places are house to many tourist traps and scams. Staying alert and being aware of your surroundings is mandatory by this you can take full advantage of your time and enjoy the iconic monument or the museum. Later on that day I was exploring the boulangeries (bakeries) binging on some authentic croissants , Pain au chocola (a sweet roll consisting of chocolate) and Pain aux raisins (sweet rolls consisting of raisins) and of course coffee! I also explored a few brasseries (brewery). However boulangeries are my recommendation if you want to get the bakery products cheap! when it comes to brasseries I would recommend this instead of restaurants around the touristy places to sit down and get a good meal. It's right there you just have got to walk a street away from the tourist spots and voila! you will find and authentic French boulangerie or brasseries giving you an authentic flavour to your food and also helping you save money compared to the touristy restaurants, making it an happy experience for you! A good breakfast in one of the boulangeries which consisted of 2 types of bread and coffee cost me 8 Euro(INR 650). In my entire stay in Paris I've binged on the several types of breads and explored boulangeries on many occasions. In case for Lunch and Dinner food in Paris is expensive and a good meal with a beverage can easily cost 14-16Euro (INR 1200-1300). With Christmas being a little more than a month away I also got a chance to see a grand decor at The Galeries Lafayette(a French department store chain) later that evening. Enjoying the hustle and bustle of the Parisians here and seeing them prepare for Christmas was a joy to see. Getting right into the touristy things on my third day I was heading straight to Paris's most iconic monument and an old friend of mine whom I've never met the 'Tour Eiffel'. Metros and RER's make this place accessible. Stations like Bir Hakeim, Trocadero and Champs de Mars are some of the closest to this monument. 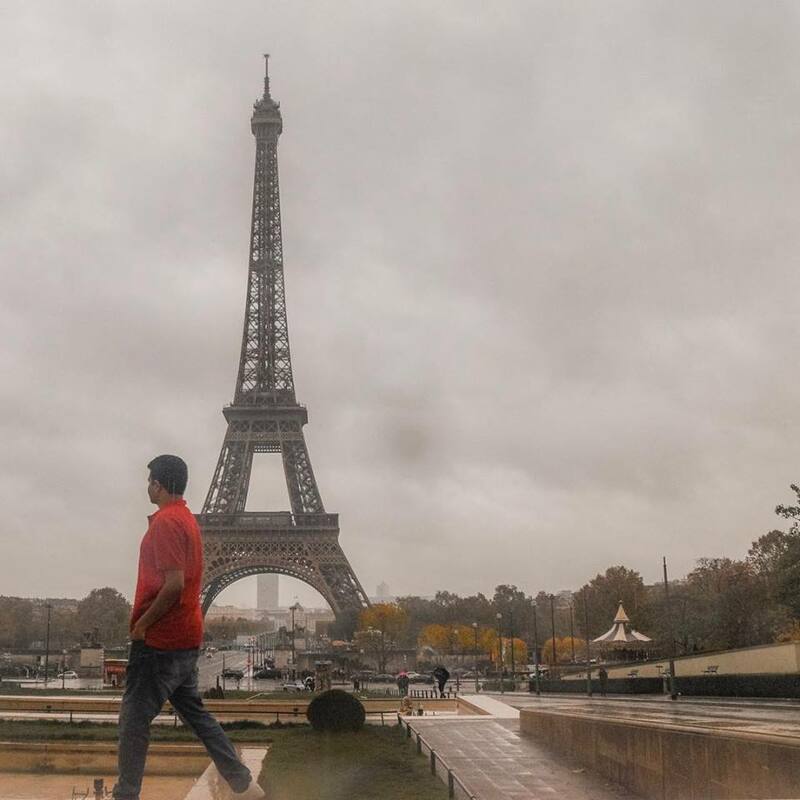 Yes, Trocadero is the best place to get a good picture with the Tour Eiffel and heading there at the crack of dawn would be ideal to be away from the crowd. I did manage to get a picture however the weather was not on my side and it was raining so you might notice a few rain drops on my picture. Please be nice I am still a novice photographer. Exploring out and about the Tour Eiffel area I did notice the most extravagant bridge in Paris, 'Pont Alexandre III'. Another iconic figure in Paris connecting the Champs-Elysees quarter to the Tour Eiffel block. A good postcard picture here is guaranteed! As the sunset I made it to the most amazing road in Paris the Champs-Elysees. This place is filled with exciting brands and is home to some of the finest French brands. A treat for a shopaholic and these spots out and about Paris are best explored by foot. If you are here during sunset you can get a breathtaking view of the sunset over yet another iconic monument in Paris the 'Arc de Triomphe'. 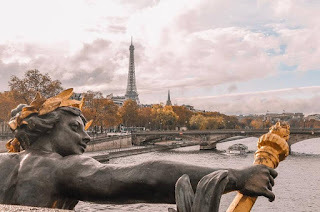 Walking around the boulevard near Champs de Mars or exploring the 'Pont Alexandre III' just gives you the best insight into this beautiful city. I would say this for all the countries I have visited that the best experiences are by exploring it on foot! Holds totally true for Paris 100%. In fact I would recommend an investment on a good pair of comfortable walking shoes before heading to Paris. Later that evening I explored the most epic moment of the 'Tour Eiffel' sparkling and glowing. I can say it was the highlight of my trip and I would recommend this is to everybody who visits Paris. It is a sight not to be missed! During the summers hiking up the tower is popular for breathtaking views of the city. Personally, when it comes to monuments I like to admire them from the outside and by setting myself at a cafe or walking around the place or sitting on one of the benches at the many gorgeous boulevards around. 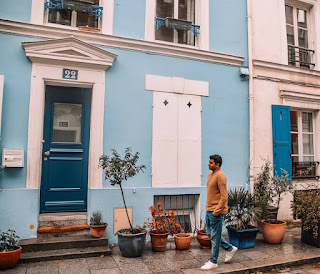 Getting things underway on my last day at Paris, I began my day by exploring an adorable and colourful neighbourhood Rue Cremieux. Here again the credit goes to locals otherwise I would not have been aware of such awesome pockets in Paris. It is certainly a non touristy place and is super fun to walk around this street and admire the colourful houses there. Since it was my last day in Paris, I quickly had breakfast at a boulangerie and was headed from one beautiful place to another I was at Montmartre. This iconic place is known as old Paris and a walk through the cobblestone road from one pink house to another house constructed in an authentic vintage French style, finding hidden gems, popular street art here and enjoying the beauty of this area by nibbling on to a crepe and finally leading to the Sacre-Coeur church has got to be on everybody's itinerary in Paris. The Sacre-Coeur church was one of the most peaceful churches I have ever visited and I totally loved the tranquillity and calm vibe the church had, a good way to end my trip at Paris. Yes my last day was a fast one but I enjoyed keeping up to the pace of the city with the time I had and my fun filled days at Paris were coming to an end. Paris was a great way to begin my journey in Europe and I totally recommend this beautiful city to all. Fun guaranteed here. Yes, I have not seen all of Paris and totally do not mind coming back here sometime again in the future, there is so much to do in this city such as a tour at the catacombs, the river Seine cruise and so many day trips from Paris to neighbouring beautiful places are to name a few which I missed out on. However, for now it gave me all the experiences that I wanted from hanging out with locals to doing the touristy things Paris, you beauty! Lost with the Parisians - My Paris Experience(Part 1). 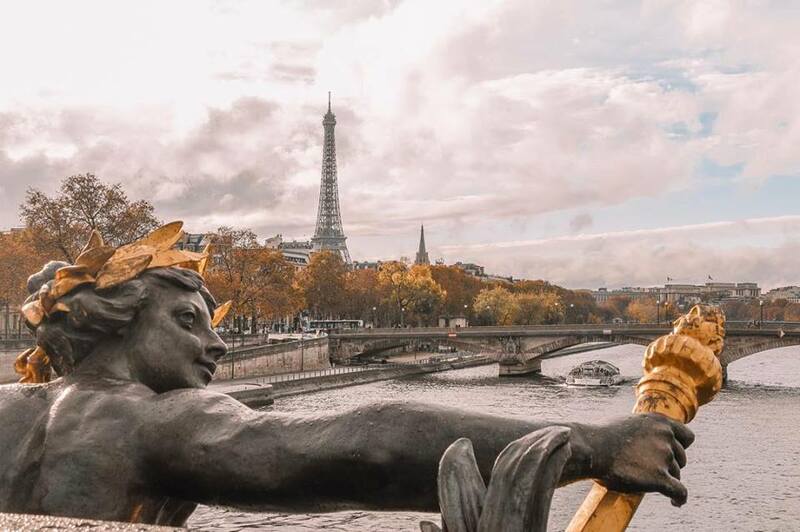 One of the iconic countries of Europe, the French Capital and I am sure Paris is pretty much one of everybody's favourite destination in the west. To me Paris was offering an insight to the culture, tradition, lifestyle of Europe and it was my first destination to get a taste of the European way of living. Dominant history, spectacular art, gorgeous gardens and boulevards, iconic monuments, delicious food and top notch brands of fashion so much associated with this city and it exactly served its expectations to the tourist in me. Of course, its super expensive but that was the challenge to live in a developed city with a budget and make the most of it. Well, first things first for an Indian passport holder getting into Paris would require a Schengen Visa. VFS Global was my to go for getting my formalities done to obtain the visa. 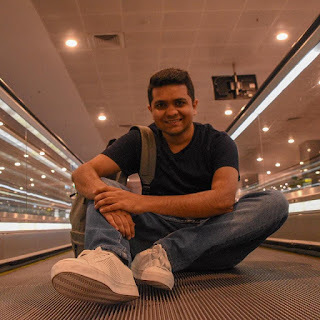 Flights to Europe can be very expensive if booked last minute as it is to many places around the globe and hence I had well planned this and pre booked my flights saving a considerable amount of money. Playing with a budget I could afford Air France airways which is a super comfortable airways with great seats, leg room and they serve delicious meals too. Here, again I opted for flying out of India mid week with a bonus of flying out on Diwali night, this is a hack I use to get my flights cheap. Flights are generally cheap on festivals and on mid week (Tuesday or Wednesday). Also another thing here is to choose your destination carefully. I was also going to be travelling to Italy after France however flights to Paris were cheaper than Italy(Milan, Rome, Florence etc.). Just a Google search of 'Bangalore to Europe' would give you so many options and you could choose among the cheapest. Air France had a direct flight to Paris from Bangalore avoiding the lay over again making it super convenient. The flight from Bangalore to Paris cost me 225 Euro(INR 18,000). With latest entertainment available to me at my seat my flight to Paris was super comfortable. Big shout out to Air France management and their team. They have done a commendable job. Touchdown Charles De Gaulle airport, I was excited to embrace the Parisian culture. A four day transportation pass at the tourist information desk cost 28 Euro(INR 2240). 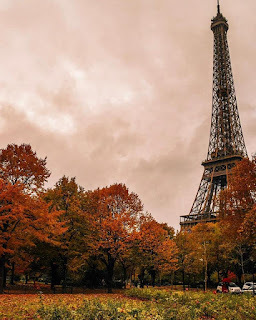 Alternatively, tickets in set of 10's or 20's can be bought depending upon the duration of stay in Paris and usage of the public transportation, a single ticket which can be used once would cost 1.90 Euro(INR 152) where as a carnet or a bunch of 10 would cost 14.90 Euro(INR 1192) these tickets can be bought at Metro or RER stations from the vending machines and can use it on all modes of transport such as Metro, RER and bus. However, these tickets cannot be transferred from Metro to RER or to Bus or vice-versa (make sure you get your ticket validated before your journey and each ticket is validated for 90 minutes from validation). I was largely dependent on public transport and therefore I opted for the transportation pass which covered my commuting out and about Paris via Metro, RER and Bus. It makes manoeuvring around the city hassle free and very convenient. These transportation passes/visitor pass depending upon your stay in Paris could be opted at the airport or at any Metro or RER stations. However, there is a tourist trap associated with this pass. Unfortunately I was victim to the trap. So, while selling the pass the person at the counter had not informed me to have my name or photograph stuck on it. I was just given the pass and told that I was good to go. On my third day I was checked while leaving the Metro station and I was fined 35 Euro(INR 2800) for not having stuck my photograph on the pass. I feel that I should have been informed about these things when I was purchasing the pass or I should have been sold the pass only if I had a photograph with me. However, I had to succumb to another person's fault and pay a ridiculous fine because at the end of the day I was a tourist in another country and I have to respect their law and rules. I would urge all those travelling to Paris or any other city in Europe(which might have a similar rule) to keep this in mind it and stay alert when it comes to validation of your ticket or pass or keep in mind my experience to avoid a lowsy fine. Well, when it comes to weather in the French capital you are in for unexpected days if you choose the less popular period of late Autumn like me to travel. Dominantly it is going to be cold and is the best time to show off your coats, jackets, mufflers and caps (one of the reasons I loved visiting Paris, during late fall). However, during my stay I did enjoy the winter sun on a few occasions and did explore the city on an absolute cloudy and gloomy day. Yes woollens are a must and apart from that your hostel or hotel will provide you with umbrellas if it's raining or snowing. Now, in Paris the language spoken widely is French, here Google translate was my go to app when it came to communicating with some shop vendors to ask for directions etc. However, in my experience I did meet a lot of people with whom I could communicate in English making things easy. Accommodation, staying in this City can be very expensive however it can be beaten with if you look at options such as Couch Surfing or Airbnb's or hostels if you are travelling solo like me. Staying in hotels can be super expensive and it can eat into your budget tremendously. As an alternative Airbnb's can be opted for half the cost of a hotel. When it comes to staying in hostels a good option would be Les Piaules which cost me 95 Euro(INR 7600) which was not too bad in a place like Paris. The vibrant social life in hostels is a great way to make friends and meet people from around the globe which was a bonus for an novice travel blogger and content creator like me I would say. Also, Couch Surfing is one amazing way to save money and living with a local is always a good option in any country or city in the world. Locals give you the best insights of their city and help you by showing you around pockets of the city which you as a tourist would not be able to explore. 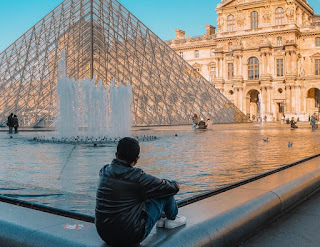 Paris is Europe's Couch Surfing capital and I believe it is an awesome way to get to know the city better. Also, if not staying you can always hang out with locals and get a pretty good insight of the city. Another option could be Airbnb experience where locals design activities based on their likes and show you a part of the city which a regular city tour would not offer you. 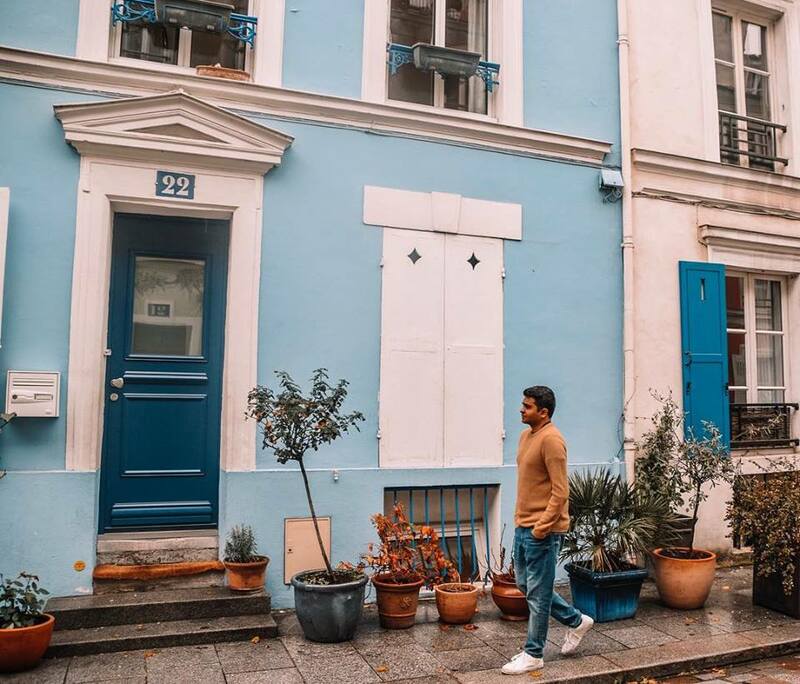 I opted for both Couch Surfing hangouts and Airbnb experiences and explored Paris in a totally unique way. 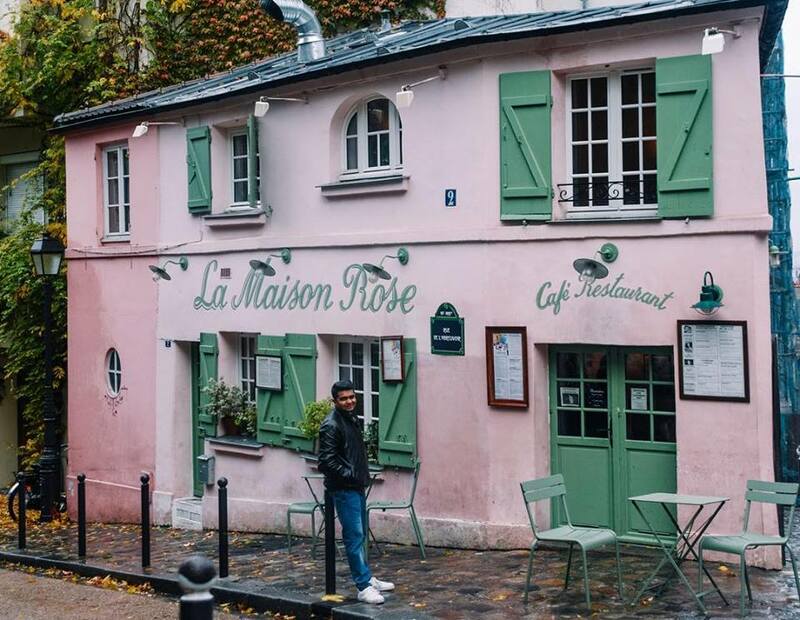 All in all budgeting in a place like Paris can be tricky But you can more or less manage by living in hostels or Airbnb's where you have access to a kitchen to cook a meal can save a lot of money. Some hotels also have breakfast included which is a good option to fill your stomach before you head out to explore the city. Hanging out with locals as mentioned earlier is another point. When it comes to clothes a carry on baggage always does the trick and you can always do your laundry at the hostel or Airbnb. Again backpacks or small suitcases are easy to carry around and they save you the trouble of using taxis. Taxis are super expensive and one of the worst ways to explore the city cause you get to see nothing. Having a rough idea of what you intend to do in the city also helps you in getting things rolling. Crocodiles submerged under the surface of the water, Birds chirping around the beautiful territory of the Kabini River. Leopards scanning and surveys their prey from the lofty trees, elephants deep in the forests in a state of trance and the majestic tiger sitting high up on the throne of the forest of Kabini. 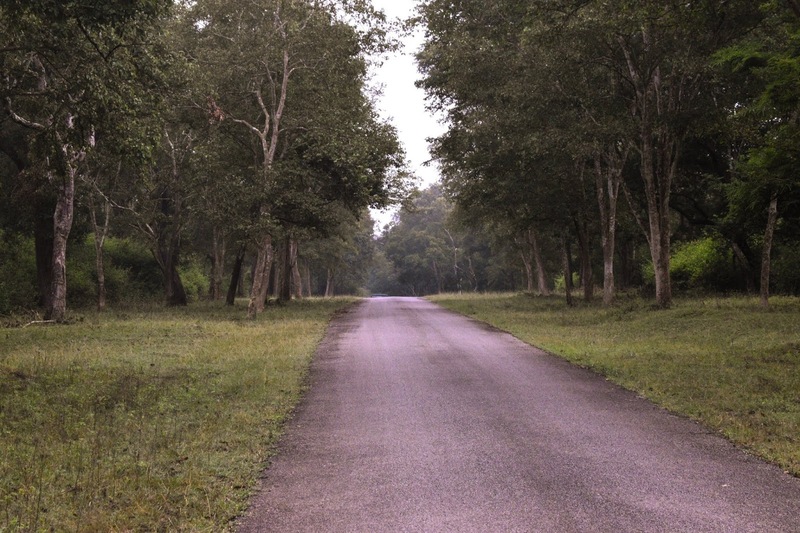 Kabini is a wildlife reserve located near Mysore in Karnataka. 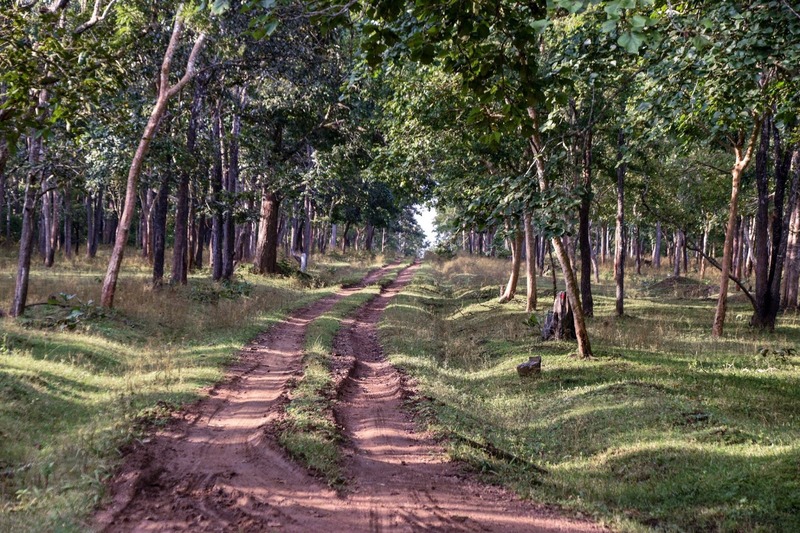 During the olden days the forest in Kabini were used as hunting grounds by the Wadiyars as hunting was a popular form of entertainment for the kings. Thankfully as time passed by this practice was given up and this forest was protected as a tiger reserve and was called Rajiv Gandhi National Park. Kabini, it a small part of this park and it gets its name from the Kabini River which flows in that area. Of course now this area has a number of fancy resorts where one can have a brilliant experience of living within the woods. I took off on yet another solo journey to this beautiful place to get out of the city stress and completely rejuvenate. As I am from Bangalore for me the easiest and best way to reach here was by road and it took me a good 5 hours to get there. Roads are sweet in this part of the country and the drive is super fun. I opted for Kabini River Lodge a property managed by Jungle Lodges and Resorts. They have several options of accommodation such as cottages, tents and maharaja rooms. They are managed by the Government and are very well maintained in terms of their accommodation, food and their safaris are flawlessly managed with a super group of guides who are well aware of the forests and very knowledgeable towards several things when it comes to safaris and more. 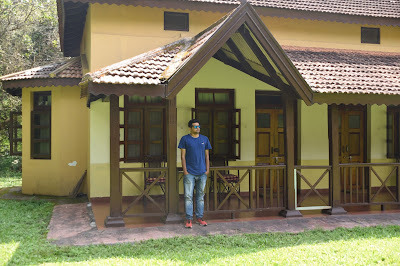 At Kabini river lodge the itinerary is simple, checked in at 12 noon after which lunch was served and I was given time to explore around their property and back waters of the Kabini River which is located right by their property. At 3 pm they served high tea and put me into a jeep with a group and we were headed for the super thrilling jungle safari. 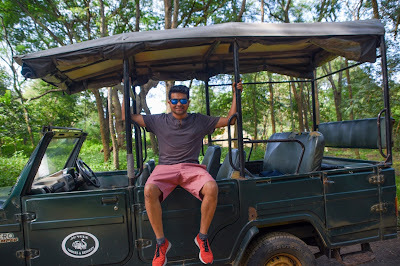 It’s a 3 hour safari into the dense forests of Nagarhole. Animal spotting here is totally based on luck. For me it wasn’t my first jungle safari so I was aware that the outcome does not necessarily need to be positive. Yes we were blessed with a rare sighting of a tigress and it was epic. I was pretty stoked by the sighting and with a mellow beginning to the safari it ended up being a super thrilling experience. In my several years of jungle safari experiences it was my first time to sight a tiger in the wild and I was very happy with this. I’ve been blessed by spotting several leopards and also had the thrill of a tusker charge at my jeep in the past on various occasions this one was another feather on the cap and it was an epic moment as the majestic beast jumped in front of our safari jeep. Back after the safari at the Kabini River Lodge I had time at leisure and could be part of their documentary screening and socialize with the various groups of people there for a while till dinner was served. The next day they have a wakeup call at the crack of dawn and I was back on a jeep into the national park for another thrilling experience. It turned out to be a mellow trip with a nil sighting apart for a few sambar deer. Well, no complaints as it were good to get into the forests and be with the sounds of nature along with birds chirping and monkeys creating havoc by jumping from tree to tree. Back to the property I was ravenous and breakfast was served. Here at Kabini your meals are well taken care of with a creative variety of food on their menu. They also cater to non vegetarian tastes on all meals. After breakfast I had some time to get some pictures out and about the Kabini River till it was time to check out. It is a comprehensive package with 2 safaris and three meals and two high tea arrangements included with the accommodation. Several properties in Kabini follow the same routine. A perfect spot to spend a weekend and re energize. 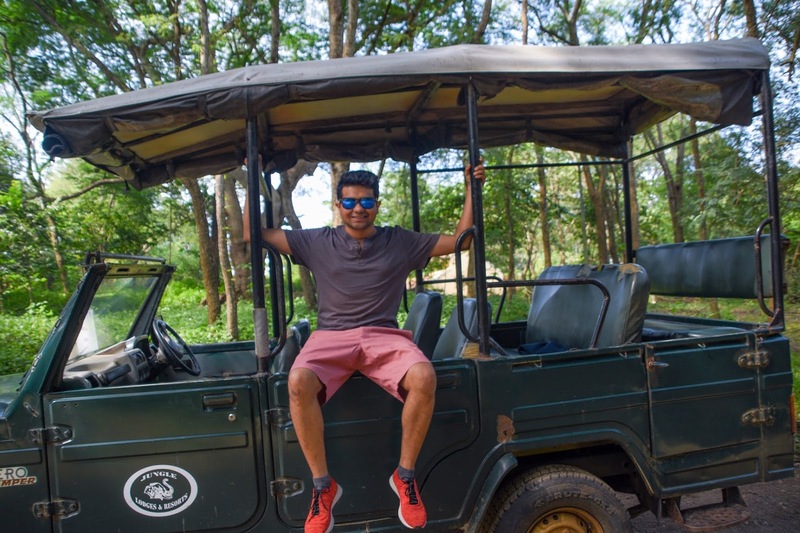 Kabini is beautiful, it’s a thrilling date with Mother Nature and I would recommend this as a must visit in southern India. 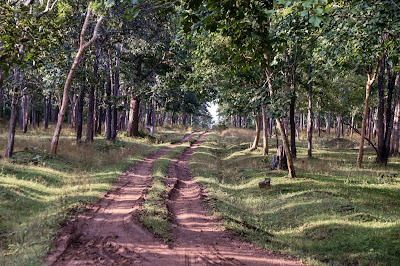 Kabini is a great place to visit anytime of the year however animal sighting is higher during the months of March, April and May. During, July, August and September monsoon can be experienced in these lush green forests with a lesser sighting. Other months around the year promise a fair experience of the jungle. 1. Closest airport is Bangalore International Airport (although I can also suggest you Mysore Airport if but the flight frequency are less) Kabini is 265kms from Bangalore Airport and 230 kms from central Bangalore. Closest railway station is Mysore Railway station, which is about 80kms away. 2. Once you enter the forest areas such as the national park and the resort you’ve taken accommodation, you need to strictly adhere to the forest rules and contribute to preserving the environment. 3. All the accommodations here do not provide extraordinary amenities and shops here are scarce. If you have any personal requirements make sure you carry them beforehand. 4. If you carry a camera you will have to pay a fee before entering the national park, your safari guide will take care of this at the entrance. 5. You can hire a camera lens at www.lensowls.com is located at Kabini and they offer delivery to your doorstep of the resort. Lens here can be rented for the time of your stay in Kabini. Entrepreneur and total vagabond with a hobby to write. Yes, travelling is what i am passionate about and i write about my experiences. Spontaneous travel journeys have made my life very colourful. Being on the move from place to place whether it is day to day work , business trips or holidays is what I love to do, very impatient to get things happening but at the same time very passionate and committed to my work/travel. Story teller and Dream seller !